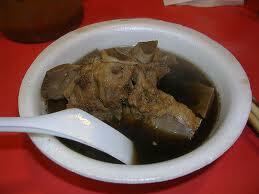 I have received an interesting complaint from my reader about this particular bakut teh stall in AMK. Think it is at AMK block 449 or 448 which is under the same roof as the market. Probably at Chong Boon Ceter AMK. I have witnessed the practice of filthy and unhygenic habits of the workers. Boycott the dirty stall. Anyway I am Muslim and don't eat pork.